Andreu Lacondeguy was the top qualifier for the Qashqai dirt jumping event in Milan and he held onto his top spot all the way through the finals. The other eleven finalists made every attempt to unseat Lacondeguy, starting with Trond Hansen, who front flipped the middle jump in his first run and followed it with a 720 attempt. After Trond’s first run, the level of riding was set at an all-time high. 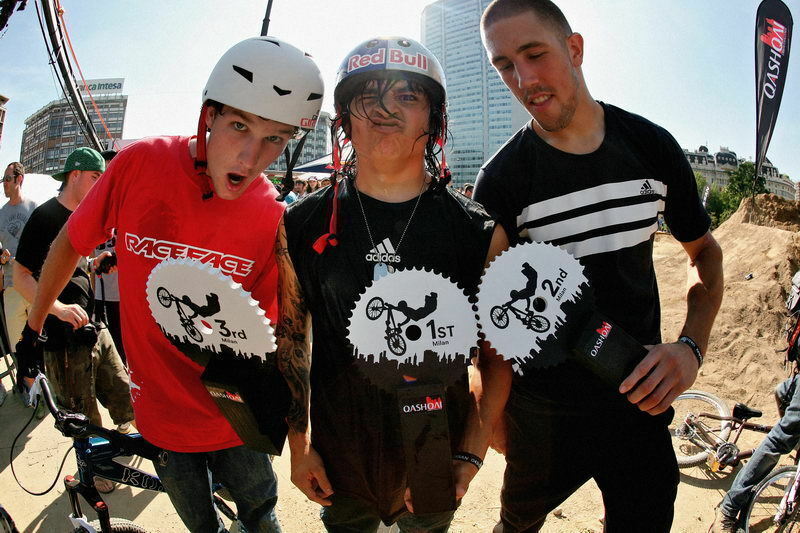 Lluis Lacondeguy, Darren Pokoj and Brandon Semenuk all followed Trond with good style and perfect tricks. 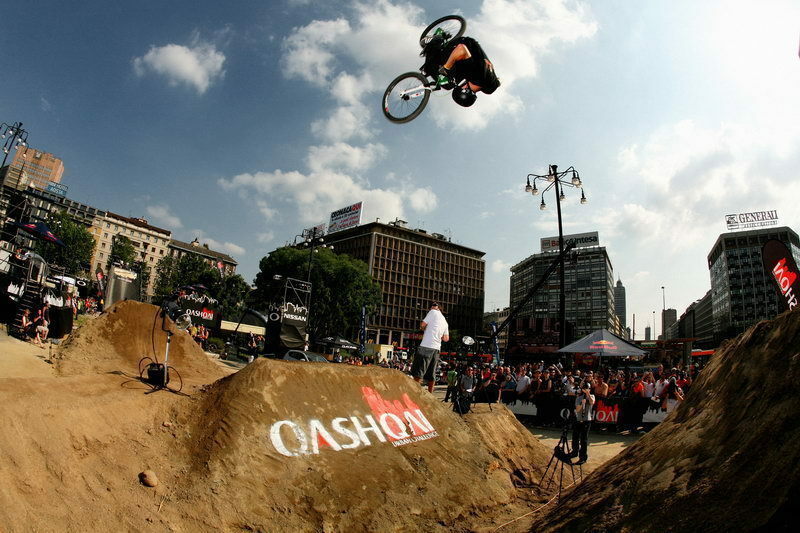 Paul Basagoitia was the next rider on the list and he continued to push the level of riding in Milan. He started with a flip on the first jump, into a three-table on the second, followed by a perfect 360-tailwhip on the last jump. Benny Korthaus, Darren Berrecloth and Greg Watts both came through with solid runs in the first final run, combining multiple tricks into each jump, like a 360-tailwhip, 360-barspin and a superman to no-foot can. Most riders in the first round of the finals were able to come through with good runs with top tricks, which meant that the next two rounds would have to be even more ridiculous in order to reach the podium. Round two was out of control. The riders were attempting huge tricks on the jumps, pushing their own levels to stay on top of the competition. Paul Basagoitia came through in the second round with a dream run. He flipped the first jump and three-tabled the second jump (just like his first run), but then found the speed to launch an absolutely perfect 720 on the last jump! After landing the 720, Paul was jumping up and down, hyping the crowd and celebrating an absolutely perfect run! The riders were all anxious to see which other riders would be able to step up to the level of Paul Basagoitia. Lance McDermott was one of the riders to answer Paul’s run with an equally impressive run. He flipped the first set, front flipped the second jump and then landed a three-whip to complete his run. By this point the crowd was going insane and screaming for more. The last rider of the second round of finals was Andreu Lacondeguy, who qualified first and wanted to stay in the top spot. Andreu rolled into the Milan dirt course and did a tuck no-hander flip on the first jump, a 360 on the second jump and a superman-flip on the last jump. Everyone was so impressed by Paul, Lance and Andreu‚s second runs, but no one could tell who would come out on top because all of the runs were so unbelievable. Going into the third round of finals, the riders all knew that they would have to put together insane tricks back-to-back in order to top the runs of round two. Riders were attempting some crazy runs, using the last jump to try to land a trick that hadn’t been landed yet in Milan, like a double tailwhip or a flipwhip. In the end, no one was able to top the level of round two. The runs from the second round would most certainly prevail in the overall scores. The riders and crowd speculated while the judges came to an agreement on the results. At an event where 720s and front flips were landed in multiple runs, judging could not be easy for Paul Rak and his panel. 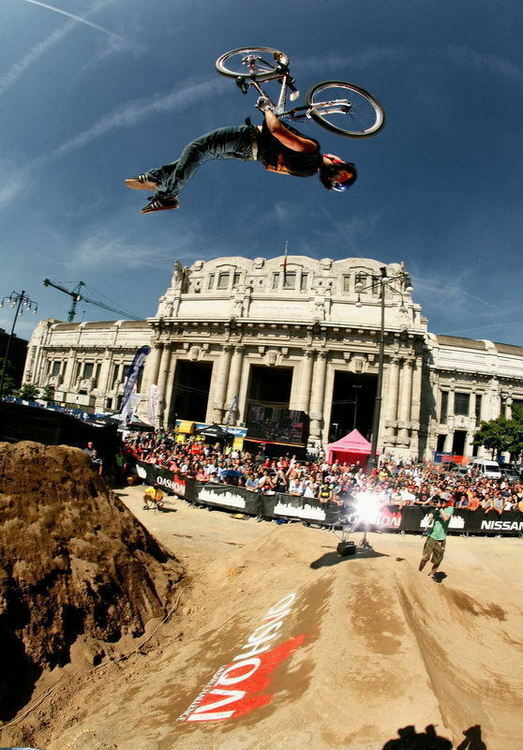 At the end of the contest, Andreu Lacondeguy was able to hold onto the lead through finals and was awarded first place at the Milan stop of the Qashqai Urban Challenge. Lance McDermott followed in second place and Paul Basagoitia came in third place. 1. Paul Basagoitia (USA) 35pts. 2. Darren Berrecloth (CAN) 32pts. 3. Andreu Lacondeguy (ESP) 29pts. 4. Lance McDermott (UK) 25pts. 5. Greg Watts (USA) 24pts. 6. Ben Boyko (CAN) 23pts. 7. Brandon Semenuk (CAN) 19pts. 8. Kyle Strait (USA) 17pts. 9. Cameron McCaul (USA) 15pts. The next stop for the Qashqai tour is Madrid, where riders will be tested at their skills on a street course, designed by pro street rider Jeff Lenosky. Visit the Qashqai Urban Challenge website (www.nissan-qashqaichallenge.com ) with information about each city, the events, rider bios about the invited tour riders, results and rankings.